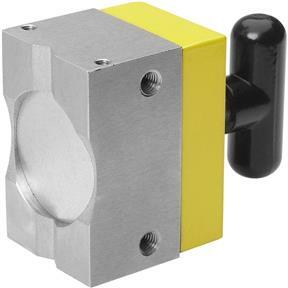 An on/off magnetic work-holding square with 165 lb. 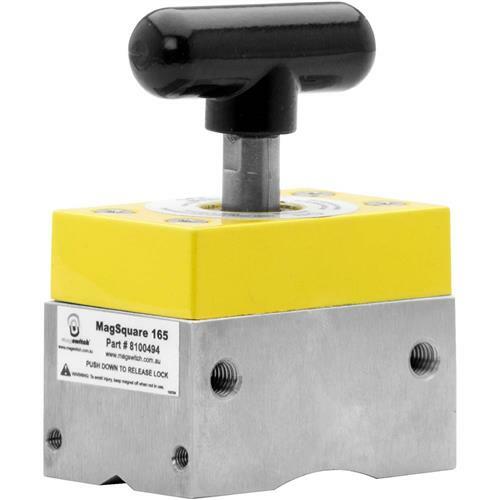 (75 kg) of hold force from Magswitch Technology. M5 * 8 threaded holes on all sides and machined at 90° magnetic grip on 5 sides—strong on 3 sides. Allows for super fast set-ups and instant work-holding and it stays clean; when the square is off, debris falls right off. Grips flat and pipe for better versatility. Full Saturation Thickness is 0.25"/6.35mm, 2:1 Shear Working Load is 18.5 lb./8.4 kg.